My ancestors have lived in southern Quebec, Canada and on both sides of the Kwinitekw (Connecticut) River in New Hampshire and Vermont for hundreds of years. By doing beadwork in the same style and manner as my ancestors, I honor those who have gone before me and give to those in the future. 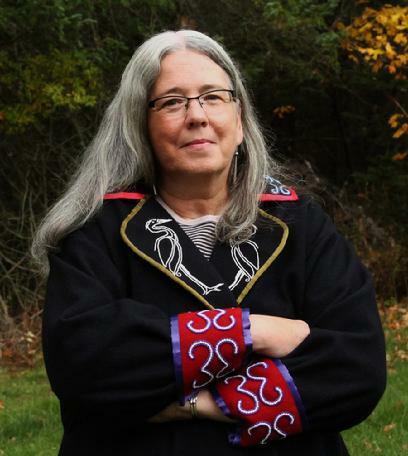 Through beadwork, the reality of Abenaki survival can be shared and acknowledged. Through beadwork perhaps my brothers and sisters, my relatives will recognize a piece of who they are and who they were. Perhaps some will be inspired to learn more about their culture. Perhaps others will be inspired to pick up a needle and thread and tell their own story of survival. To me, beading is breathing. It is that natural and essential. Just as breathing keeps the physical body alive, beadwork keeps my spirit alive. Beadwork designs that are influenced by the world around me, such as mountains or medicine plants, keep me observant, grounded and grateful to Mother Earth. Designs received from the dream world and visions are a most treasured gift. I marvel at waking up in the morning with a beadwork design fully developed in my mind. The colors, the patterns, the symbols and the meaning- it’s all there! Every stitch becomes a prayer of thanksgiving to my ancestors and the Creator. My needle just flies when making such a project! These designs are the most powerful; the physical manifestation of spirit captured in bits of glass and cloth.